For Jason Samuels, the Change Step programme, not only gave him his life back but also that of his whole family. Previously only available in north Wales, the Change Step programme is now being rolled out on an all-Wales basis and will be launched at an event in Cardiff on Wednesday 1st October. Jason, 43, from Wrexham, served with the Royal Army Medical Corps and saw action in the first Gulf War. Due to the action he went on to suffer from PTSD (Post Traumatic Stress Disorder). For years he struggled to get help and he used to self-medicate with alcohol and drugs. By his own admission his life was going nowhere and went from job to job not caring about anything. He suffered a heart attack in June 2013 and it was at this stage that he told the staff he suffered from PTSD. Through NHS Veterans’ Wales he was put in touch with Change Step. He hasn’t looked back since. Jason, said, “Change Step is a peer mentoring service for military veterans who wish to make positive changes to their lives. The mentors are all veterans themselves and to me this is the reason why Change Step works so well. “You’re not talking with somebody who has just been on a course to learn about these things. You’re talking person-to-person with somebody like you who knows exactly how you feel and has been through the same experiences. The trouble with guys like myself is that generally you can’t tell there’s anything wrong by simply looking at the physical body. 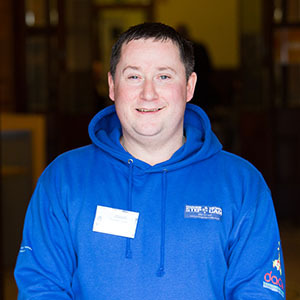 “If I had any problems I could just pick up the phone and speak to my peer mentor, Dave Nolan. After a good few months I felt considerably better and before too long I went from being a client to becoming a peer mentor myself in Wrexham. Today I have over 20 clients of my own. I also run a drop in session in Wrexham every Thursday and arrange volunteer days such as tidying up war graves as part of the Remember Our Heroes project. “The volunteering is therapeutic and working as a team is really good for people’s morale. I have seen great changes in veterans who join Change Step, even after just a few weeks with us, and these volunteer days fill them with a sense of pride and raise their self-esteem. For some of them, it’s the first time they will have socialised with others for a long time. “I’m less anxious in going out now. I would often get so anxious about going out or meeting people that I would throw up. That’s a thing of the past. I’ve managed to change my attitude to crowds and supermarkets as I’ve now managed to successfully question why I was feeling like I was. “I’m much more sociable with my family. I had effectively neglected them for 16 years by keeping myself to myself. In the past year, I’ve managed to get to know my family once more.